Treat your loved one this Valentine's Day with a romantic dinner and show at Doo-Bop. Enjoy "A Night Of Love" with The Kitty Kats…a delicious two-course dinner immersed in show-stopping harmonies. 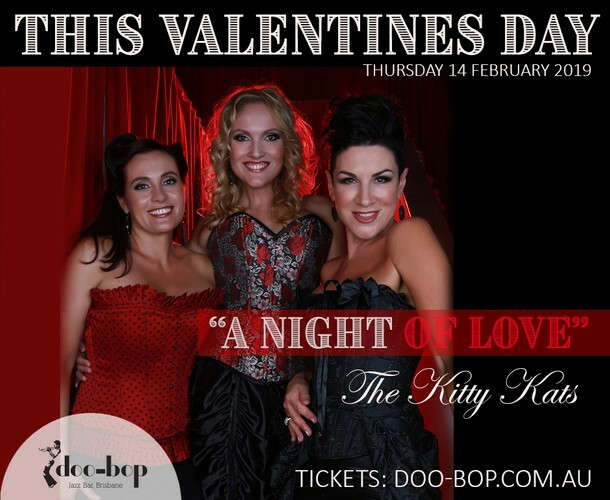 Three of the Sunshine Coast's most loved performers have united to form the all-female powerhouse trio, The Kitty Kats. Vocalists Michelle Brown, Susanne Campbell and Renae Suttie bring their show-stopping 3 part harmonies to the stage, in a spectacular floorshow that is musically superb and visually enchanting. With a touch of romance and a pinch of sass, The Kitty Kats will have you "loving the skin you’re in." "If you haven’t seen these girls perform, you are missing out on three of the greatest vocalists in this country. Ripping harmonies and an incredible stage show makes The Kitty Kats a must see."